Miguel’s Jr. is pleased to announce the new location in Norco, California, located in the brand new Norco Village Shopping Center, will celebrate its grand opening on Thursday, January 18 at 10:30 a.m. 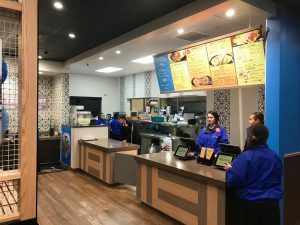 The celebration will begin with a ribbon cutting ceremony hosted by Miguel’s Jr. founders Mike and Mary Vasquez and President and CEO Javier Vasquez, followed by complimentary lunch for all in attendance. The location launched a soft opening on Tuesday, January 9 and will continue to operate on normal business hours. The new Miguel’s Jr. Norco location marks the brand’s 18th store in California and the first of its new redefined drive-thru concepts. The new test location, spanning 2,500 sq. ft., offers a smaller dining room and larger drive-thru with 30% greater capacity than the typical store drive-thru model. The Miguel’s Jr. retail strategy is focused on speed of service and order accuracy. Thursday, January 18, 2018, 10:30 a.m. – 11:15 p.m.
Friday: 7 a.m. – 10:30 p.m.
Saturday: 8 a.m. – 10:30 p.m.